Here it is! 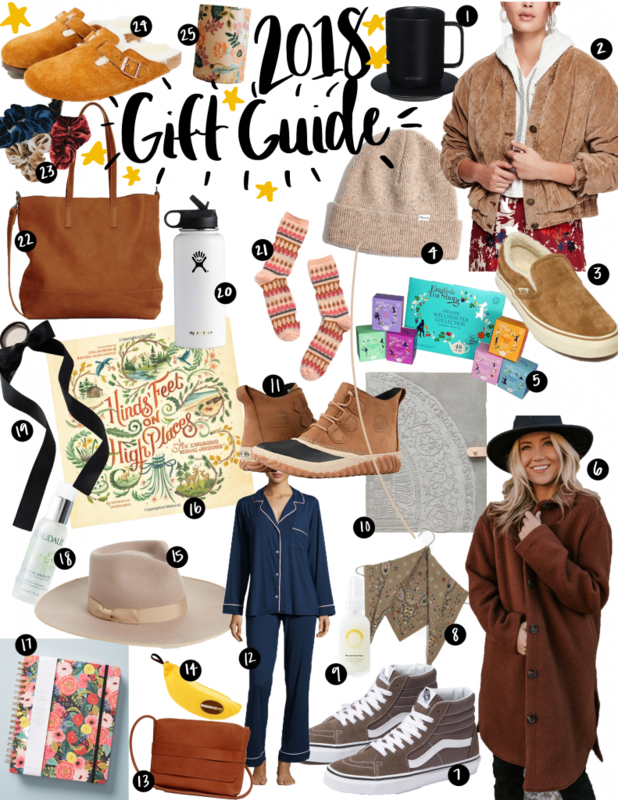 I finally finished the girls’ gift guide! John Luke just received this as a gift and is OBSESSED with it. When he first got it and was telling me about it he said, “This is the perfect gift because I’ve wanted one for so long but could never justify the cost for myself haha.” It really is cool and useful for any coffee and tea lovers. You poor your hot drink in and the mug has a heater in it so it keeps it hot and just the right drinking temperature. It comes on a little charger it sits on, so you just put that in the cabinet and put the mug back on it when you’re not using it. I love to borrow it when he’s not home! Such a great fit and perfect for guys too! I love Free People but I love it even more when it’s given as a gift haha. I love to ask for a Free People coat for my birthday or for Christmas because I generally will not buy one for myself. This one is AMAZING. I feel like every season they come out wth one that stands above the rest and I think this is definitely the one! Great too because it’s neutral so can be worn with so much. I have two shearling shoes on this list and thats because who wants cold feet??? These are super fun slip-on shoes! The Madewell x Vans collabs are always killer and sure to be loved. They always seem to sell out so quickly! Shout out to Madewell again! I have this beanie in pink and love it. Wools is always a little itchy to me, but SO warm that its always worth it. I think beanies are so cute but also so needed haha. My mom gave me this last year and it was such an unexpected fun little gift that has just kept on giving! I’ve had so much fun trying out all the different kinds of teas that came in it. Great for your tea-loving friends! I think this coat is so pretty! A long brown coat is actually on my personal list hehe. Just a good basic that everyone loves and can be in your closet for a long time. This one is from Roolee and is on sale! I’m obviously partial to shoes. Vans are always just such a fun gift I think! I gave my sister a pair last year for her birthday and she has loveddd them. Ya can’t go wrong with a bandana! This one is super cute! They are so great too because they are so versatile. They can be worn multiple ways in your hair, around your neck, or on your bag. This would be super cute to tie on top of a gift too! This is an expensive beauty gift to give to your pals who love to try new things. This came in a FabFitFun box and my friend and I had SO much fun trying it out for the first time, and now I use it in my skincare routine and wow could go on and on about it (in fact I will soon in a skincare blog post!) This is a mineral peel that within seconds of spraying it on your face lifts debris and dead skin. Then you just rub it around with your fingers and be amazed! It makes your face feel like a baby’s bottom haha. It’s so satisfying and fun to do. Someone who loves trying beauty products would enjoy this! I received last year’s version of this journal for Christmas last year. I loved it so much. For anyone who journals this is such a great journal. I actually gave it as a gift the year before. It’s leather and just feels so nice to write in. These are just fun rainbows! My mom gave me these as a gift a couple of years ago and I’ve posted in them on Instagram and they were a hit! Sorel makes great boots. These are kind of like “duck boots” I guess but with a fun little twist. These are quite possibly hands-down the best gift I’ve ever been given. John Luke gave them to me for my birthday this year and I have raved about them. They are the softest, most comfortable pajamas. They’re the kind of thing you wouldn’t want to buy for yourself because they are more pricey, but are SUCH a great gift. I still go on about how great they are to him haha. This is a purse by FashionAble. I showed this one and then also a larger one. Any girl loves a brown leather purse. Theres are super great quality, but also they company is amazing. They are a brand that is focused on ending poverty by providing economical support for women! Great products and great people. Definitely check them out for any leather good needs. Another gift you cannot go wrong with! WOW we love this game. I just think hats are awesome and so much fun! This one is nice and seems like it will last a while! Hinds’ Feet on High Places is one of my favorite books. It’s an older book from like the 50s and the cover has been redone here so it also is just beautiful. I promise though that the meaning and point that is conveyed within the pages is even more beautiful. For any of your reading friends- this is a good book! Christmas means that the new year is just right around the corner! A planner is a fun and useful gift to give. I personally love Rifle Paper Company’s. They are so cute and well set up. This is specifically great for any college girls who have all their school assignments to copy down. Same here as with the mineral spray! Great for any beauty-product-loving girls! This is also something I use in my skincare routine and its amazing. This is Caudalie’s mini beauty elixir. It feels amazing and helps to hydrate your skin. Great for setting makeup as well. I have personally been loving bows and ribbons and hair scarves lately! They’re rather popular right now and would be a fun lil’ gift for someone! This black one is great because it would go with so much. I’m a big fan of Hydroflasks. They keep hot things hot and cold things cold. Favorite water bottle I’ve ever had. Socks are ALWAYS a good gift. ALWAYS. This is another from FashionABle! I have this one and its the perfect purse in my opinion. Scrunchies are such a fun gift! Hair ties are something a girl can never have enough of. They are always finding their way off and needing to be replaced haha. Slippers and shoes in one! Slippers are a solid gift. And if they can be worn out of the house too what a win?! What a cute candle?! Someone gave us one like this a couple of years ago and it’s so great because now I reuse the cute jar for other things! Everyone loves a good candle, especially a cute one! Also if you made it through without noticing that random line then good for you because me too haha. Sorry about that! Only noticed when I finished and now its wayyy too late to go back and change. Whoops! Love that jacket!!!! Have you ever ordered from roolee? Not sure about sizing?